There are a variety of non-surgical treatments that encourage hair growth or improve the overall hair appearance, available to be used in parallel or as an alternative to surgical treatments. Some of the non-surgical treatments might not be suitable for some types of hair loss or may need weeks or months to show their effect. At Fortes Medical we discuss all the possible treatments with our patients to achieve the best results possible. SMP is a method of depositing pigment into the dermal layer of the skin on the scalp, which gives the illusions of hair follicles, with the appearance of a recently shaved head. SMP is colour matched on a grey scale for most clients and can be used to treat clients of very pale complexion to extremely dark skin tones. There are a few different types of medications you can take to encourage or strengthen hair growth. The most effective of all is Oral Finasteride (Propecia®), taken in tablet form. A similar medicine to Finasteride is Dutasteride (Avodart®) which we also prescribe. PRP is often used to both encourage hair growth and improve the quality. We take a sample of a patient’s blood and spin it in a centrifuge. Once rotated, the platelets are separated from the rest of the plasma and settles into a concentrated form in the sample. 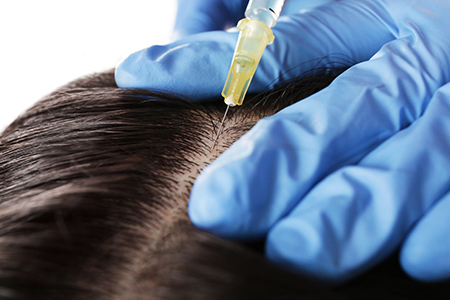 We then inject the platelet-rich plasma into the patient’s scalp to encourage hair growth. When exposing the skin to a light frequency of 650 nm, It stimulates cells beneath to produce more protein. As it’s well documented, Keratin, Derived from protein, of a key component of hair. Higher levels of Protein leads to stronger levels of keratin and therefore stronger hair growth. This technology works best on areas where hair is still present but thinning.